As per capita income rose over 50% to nearly $2500 in purchasing power, poverty in Pakistan decreased from about 34.5% to 17.2% and hunger went down with it during Musharraf years from 2000 to 2008, as reported by World Bank and IFPRI as lagging indicators. The global hunger index score, published annually by the International Food Policy Research Institute(IFPRI), is a number between zero and 100, with lower figure signifying less hunger. Based on hunger data collected from 2003 to 2008, IFPRI reported that Pakistan's hunger index score improved over the last three consecutive years reported since 2008 from 21.7 (2008) to 21.0 (2009) to 19.1 (2010) and its ranking rose from 61 to 58 to 52. During the same period, India's index score worsened from 23.7 to 23.9 to 24.1 and its ranking moved from 66 to 65 to 67 on a list of 84 nations. At 22.67% improvement in its hunger score since 1990, Pakistan has improved less than India's 23.97% reduction, explained mainly by little or no progress in Pakistan during the lost decade of the 1990s under Bhutto and Sharif governments. In spite of the progress Pakistan made until 2008, the hunger situation in Pakistan (and Sri Lanka) is still rated as serious on a scale ranging from low level hunger to extremely alarming, and for the rest of South Asia, including India, the situation is described as alarming by the world hunger report 2010. On the 11th anniversary of General Musharraf's coup this year, the dominant and self-serving political rhetoric on the airwaves of Pakistan completely obscures Musharraf government's positive role in significantly enhancing Pakistan's economic growth, and reducing hunger and poverty on his watch. Instead, Musharraf's enemies are focusing entirely on his missteps to try and hide their own major failures since 2008...failures that have brought Pakistan's economy near collapse, reminiscent of the bad old days of the 1990s that ended with Musharraf's coup in 1999. How long can they fool the people of Pakistan? Only time will tell. Of course the poverty declined. Because one third of them joined the politics, one third of them got selected in the Pakistan cricket team and the remaining got wiped out in the floods. varun: "Because one third of them joined the politics, one third of them got selected in the Pakistan cricket team and the remaining got wiped out in the floods. " I know this is hateful comment from you based on your anger and jealousy, but let me just make sure you understand the 17.2% poverty rate data pre-dates the Pak floods by a couple of years, reflecting the situation back in 2007- 2008. Poverty is most likely worse now than it was in 2008. 1.Politics is the art of the possible so radical stuff like abolishing feudalism is a non starter. 3.India is not going to compromise of kashmir regardless of how much Pakistan or Sunni Kashmiris (accounting for 40% of Indian Kashmir population)scream.The world has moved on nobody is going to push India on this issue and the Indian state with its resurgent pride and chest thumping nationalism is NOT going to cede ground on Kashmir. I would be very interested in your view of what should be Pakistan's future course of outcome given these constraints. anon: "Why not make a well thought out post about what should be done"
In spite of serious political and security situation in the region, Pakistan was doing just fine during 2000-2008 in Musharraf years. It's already made Pakistan the most urbanized nation in South Asia with the largest middle class in the region. I believe Musharraf could have accomplished what East Asian dictators did in 70s and 80s if he had more time...another decade to continue his consistent economic reforms and growth. Along with economic growth averaging 7% annually, Pakistan experienced significant declines in poverty and hunger from the year 2000 until 2008, according to figures published by the World Bank and the International Food Policy Research Institute in their separate reports published recently. 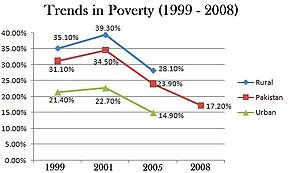 Poverty in Pakistan decreased from about 34.5% to 17.2% and hunger went down with it during Musharraf years from 2000 to 2008, as reported by World Bank and IFPRI as lagging indicators. The global hunger index score, published annually by the International Food Policy Research Institute(IFPRI), is a number between zero and 100, with lower figure signifying less hunger. anon: "India is not going to compromise of kashmir regardless of how much Pakistan or Sunni Kashmiris (accounting for 40% of Indian Kashmir population)scream." Since when is it "sunni Kashmiri" issue? Are you desperate as to mis-characterize the basic demand for freedom by the vast majority of Kashmiris? India will be be forced to compromise not by Pakistan, but by the strong will and the passionate continuing struggle of the Kashmiris themselves. Musharraf is history,he has no political base in Pakistan as such the army doesn't like him hawks like hamid gul have openly called him a traitor and the fact is in Pakistan you can't win elections if you don't have support of feudal lords ordering their serfs to vote en masse. Well it hasn't so far.. Regardless of all the committees, concerns,crocodile tears etc etc by the Indian state you know very well that NOTHING is gonna change.its just a ploy to grind you down. Think of it as the Indo pak equivalent of reagan's defence policy.We spend roughly $10 billion pa in deployment in kashmir. This makes sure you directly and indirectly spend ruinous amounts on your defence at the expense of everything else which insures you never have the surplus capital to invest in an industrial base of any worth (screw driver assembly of chinese rockets,planes(metal shell only) and bombs doesn't count). Basically from a pure brahmanical(ends justify the means) standpoint the kashmir conflict is in India's best interest. If it is quickly solved by say demographically swamping 4mn kashmiris with 10 million hindus(ala tibet) then Pakistan will accept it as a fait accompli(like the annexation of junagarh and hyderabad) and scale down its defence budget but the idea is to keep you in an eternal state of tension and war so that you never have time to think of things like an industrial policy etc. Though yes Musharaf was by far the most brilliant leader you ever had,infact there was a strong rumor of his ancestors being brahmin converts to islam.ROFL! The latest poverty data of 17.2% poverty rate in Pakistan from the World Bank is based on $1.25 a day poverty line, not $1 a day. MPI is based on 2005 data which was 23% under $1.l25 for Pakistan , and the World Bank poverty figure of 17.2% uses 2008 data for Pakistan. The Indians here know that how much poverty,hunger our country has. But our problem with ur blog is how u show it to demonize India. Why don't u make ur blog more as a friendship blog, rather than increasing hate between the two countries. Whatever ur figures in 2000-08 be, we know what is the current state in Pakistan because of war on terrorism, floods, economic stagnation, sectarian conflict.... But we are not glossing about it. It may be prudent that u write posts which helps to solve these problems, and we would be happy to give u our suggestions for it. But currently u r only increasing the hostility. Today’s news on the death of fifty people from hunger at Balangir in Orissa is a grim reminder of the little growth story that India has had. It clearly indicates many negative facets of our system, bureaucracy and the public at large. 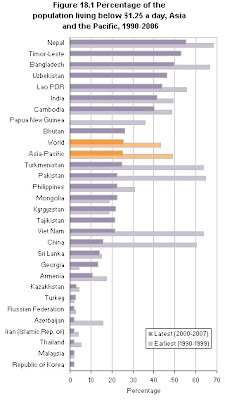 As per the World Food Program, almost half of the world’s population who are deprived of food live in India. Another website of a well known NGO (http://www.bread.org/learn/hunger-basics/hunger-facts-international.html) offers a grim picture of this particular issue especially when the same is getting the least attention by the policy makers across the world. If 50% of the starving residents belong to India, we do not need to look beyond our borders to nail the culprits. More than six decades post independence and being counted as one of the key growth engines to the world economy, why are hunger deaths still happening in India? Is it because there is a scarcity of food to offer the ones hungry? Clearly that is not the case. Those leading a life above the poverty line pay taxes to the Central and the State Governments so that it is used for public facilities, amenities and for the benefit of those living the poverty line. Obviously, those in power have to let go of their hunger for corruption or we have to watch the country going down the drains. Otherwise, it would constantly fail to administer the proper distribution of food and nutrition to people who matter. We all talk about “3 idiots” and how a college principal is called a murderer who is responsible for the suicide of the students in his college. In the same way, aren’t the following responsible for the demise of people from hunger in our country? 1. Politicians responsible for making food security and food distribution laws. 2. Governmental agencies responsible for proper storage of food grains. 3. Bureaucrats responsible for administration and distribution amongst the right people. 4. Local security agencies which must maintain law and order to ensure proper distribution. And why is it that they are not punished for these deaths. We have poor being imprisoned for thefts but those in power prosper, while the poor suffer. Is there any accountability for what is being and can be done to break this nexus? Would those in urban cities who are fortunate enough to be writing and reading this blog do something about it? Would they start taking candle light walks in memory of those unfortunate who die in India of hunger every day? Will they go beyond the regular candle marches or force those in power to take responsibility and amend their ways? Original report can be taken from the above url. pg no. 46, statistics collected between 2003-08 and the same is not current. It does not take into consideration the chaos going in the pakistan and impact of the same on the economy and the people. pakistan has started with a great lead in the initial few decades which is reflected in 24.7 vs india's 31.7. As per the statistics, pakistan had a reduction of 22.67% where as india at 23.97% which is marginally in a better rate than pakistan. Take away from this mis for india is to concentrate on "Prevalence of underweight in children under five years"
Probably Pakistan has to look into Proportion of undernourished in the population as it is deteriorating and Under-five mortality rate where they could work for more progress. Funny how most of your research skills dont extend to the period of '09 and 2010. Guess, the numbers are not that pretty for Pakistan during this period where "bloody civilians" are in power(but not greater power than what the military possesses). anoop: "Funny how most of your research skills dont extend to the period of '09 and 2010." There is nothing funny about it. Given the understandable lag in reporting, I have blogged about reports and data on poverty, hunger, disease, etc. released by international organizations recently which only cover the period until 2008. I know there is nothing funny about poverty but what I am pointing out is obvious deletion of data of years 2009 and 2010. "Given the understandable lag in reporting, I have blogged about reports and data on poverty, hunger, disease, etc. released by international organizations recently which only cover the period until 2008. " --> Well, not really, if you wanted to honestly look at it. The above article gets the data from Food and Agriculture Organisation. It says,"The country’s population has jumped to 184 million in 2010, 119 million in 1990, of which 73 million Pakistanis have fallen below poverty line, SBP said. The poverty level during 2010 rises by 4 percent to 40 percent, from 36.1 percent in 2009." In the concluding article it says:"On the other hand, the new Governor of State Bank of Pakistan, Shahid H Kardar, said that there is lack of monetary discipline – which is the biggest challenge for the economy. If the country’s monetary system is put on the right track it would definitely help reduce pressure of the government’s borrowings on economy, reduce inflation and ease the burden of poor.On September 7, the currency slid to a record lows versus the US dollar, losing 17 paisa for buying at Rs 86.01 and 18 paisa for selling at Rs 86.06 in the inter bank market. The other cause of inflation is that the Pak rupee is losing its value against major international currencies. On 7th September, it fell to a record low versus the US dollar, losing 17 paisa for buying at Rs 86.01 and 18 paisa for selling at Rs 86.06 in the inter bank market. The value of Pakistani currency has decreased almost 33 percent in 30 months. The value of Pak rupee is expected to further reduce both in the inter bank and open markets in the coming days. The result of this unofficial devaluation would be a rise in prices of goods, cost of production and increase in inflation making people hungrier in Pakistan. There are indications that the growth rate during fiscal year (FY) 2011 would be far lower than estimated, the budget deficit would increase further and the inflation rate may double the target of 9.5 percent." Another paper which speaks about poverty going through the roof in Pakistan in 2008-2010. It says:"Pakistan's economy has slowed significantly during 2008 and 2009 in the wake of high international commodities prices, record-high inflation, a worsening external position and a slowdown in foreign investment, all of which combined to create a serious current account crisis. This is having a significant and potentially long-term impact on the country's efforts to reduce poverty, as development spending in the social sectors is being squeezed by the parlous state of government finances. With rising food and fuel prices placing increasing pressure on the livelihoods of the poor, and Pakistan's economy under growing strain due to political instability and external shocks, the challenge is to maintain high growth rates and ensure the benefits are broadly spread. Overall, the government is anticipating a fiscal deficit of 4.9 per cent of GDP with real GDP growth forecast to slow to 2.7 per cent per cent in 2009–10 (from 3.7 per cent in 2008–09). Year-on-year consumer price inflation reached a record high of 25.3 per cent in August 2008 before declining to 11.3 per cent in early 2010. The International Monetary Fund (IMF) estimates that food and non-food prices rose by 23.7 per cent and 18.4 per cent between respectively between 2007–08 and 2008–09, resulting in a 21 per cent reduction in purchasing power. Unemployment in 2010 is estimated at 15 per cent, up from 7.6 per cent in 2006 due to slowing consumption growth and power cuts impacting on industrial outputs. In November 2008 the Government was forced to accept a US$7.6 billion loan from the IMF, which was augmented to US$11.3 billion in August 2009. The conditions of the loan require an ending of electricity subsidies (causing further price rises), an increase in official interest rates to curb inflation, the ending of government borrowing from the central bank and a sharp reduction in the fiscal deficit through spending cuts and efforts to increase revenue collection. " The Daily Times figures you refer to are just estimates...not firm data and it offers no comparison with other countries such as India. If you go by such estimates, then you also have to acknowledge that, according to India's planning commission, there are 100 million more poor in India than there were three years ago. If you are interested in comparative data, you really have to rely on reports that do comparisons such as the MPI poverty report by Oxford or hunger report by IFPRI which I referred to it in my post. Both of these reports show Pakistan has done relatively better than India. "The Daily Times figures you refer to are just estimates...not firm data and it offers no comparison with other countries such as India." --> Nobody goes and physically calculates the number of poor or physically count the Gross Domestic Product. Your arguments are highly partial. Comparative analysis should be done with countries Pakistan has similarities with. India is a high-growth country with 7 times the number of people than Pakistan, with an active democracy. On none of these Pakistan has. So, how can comparison be even considered. "If you go by such estimates, then you also have to acknowledge that, according to India's planning commission, there are 100 million more poor in India than there were three years ago. " --> The odd part is UN tells a different story. Indian planning commission could be using higher standards for measuring poverty levels than the UN. "According to the 2010 report of the United Nations on the Millennium Development Goals (MDGs), While India is expected to reduce its poverty rate from 51 per cent in 1990 to 24 per cent in 2015, reducing its number of extremely poor by 188 million." Interestingly it goes on to add: "But the rest of South Asia[Including Pakistan] and sub-Saharan Africa are falling behind in meeting the target of reducing poverty by half by 2015." Another paper on comparing India and China. Yes, the only country India can be compared with is China, not Pakistan. Frankly, hyphenating India with Pakistan is an insult. reduction decelerated, especially in rural India." Then you say,"Both of these reports show Pakistan has done relatively better than India. " --> Thats the problem. You pick and choose reports. How can a country which is growing at an average of 8-9% be beaten by a country growing at an average of 4% this decade? It defies logic. But, it could be this. Pakistan pre-1990 had better figures compared to India. After 1990s when the reforms started to kick in India started out performing Pakistan,to an extent they are not even considered equals. While Pakistan's political and economic mismanagement started to catch up. Pakistan's stability was compromised and hence, India surged past it in every sector or atleast reduced the lead by a great margin. India started the 90s from position X and Pakistan 2X. India has moved onto 4X but Pakistan might have moved to 3X. India has comparably done better than Pakistan in the past 2 decades but in relative terms might be behind Pakistan in few aspects. The important point here is India is seen as a growth story and Pakistan, well you know. In about 10 years, all the "comparative" study you will be doing will start showing opposite results by your own standards. India has reduced its poor by half in 2 decades. Will probably redo the feat in just the following decade. Lets look at the Human Development Index and see who has made better and faster progress: India vs Pakistan. India's index rating in 1980 was 0.427 and Pakistan's was 0.402. Not much difference was there. Anyway, lets look at 2007 figures. India's rating increased to 0.612 and Pakistan to just 0.572. India(0.612-0.427= .185). Pakistan(0.572-0.402=0.170). China during the same period(0.772-0.533=0.239). This comprehensively proves that while India has done better than Pakistan, it hasn't done as well as China. Since, China had a head start in reforming the economy this trend might be explained. But, no excuses for Pakistan to lag behind. Its political and feudal structure is dragging it down. Pakistan on the other hand is barely growing as I pointed in an earlier post as its population growth remains alarmingly high. The newyork times points this out with respect to Pakistan. "A British Council report last fall estimated that Pakistan’s economy would have to grow by 6 percent a year to keep up with the expanding population, which over the past 20 years has been growing at twice the world average. The economy grew by 2 percent in 2008, the last year for which the government has statistics. " So, Pakistan is missing the mark by 2 to 3%. That is, its growing at 50% to 75% the required growth. This will push the required growth to levels that Pakistan cannot reach in few years. Considering the political, security and economic instability in Pakistan this is a very real possibility. P.S. I know I tried to compare India and Pakistan, but I did it to prove a point. Comparing India with Pakistan is like comparing Apples with Oranges. anoop:"How can a country which is growing at an average of 8-9% be beaten by a country growing at an average of 4% this decade? It defies logic." First, a correction: Pakistan has grown at 7%, not 4% for most of the decade of 1999-2009. Second your argument is that overall economic growth should translate into poverty reduction. But the facts about India show otherwise. The reason is simple. Almost all of the income growth in India has been in manufacturing and services sectors. The rest of 70% Indians work force (vs 54% of Pakistanis) work in agriculture and textile where the Indians productivity is only two-thirds of their counterparts in Pakistan. 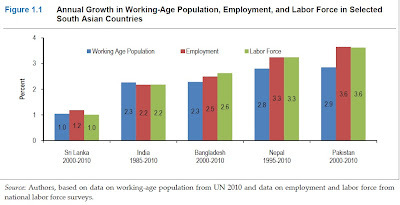 "First, a correction: Pakistan has grown at 7%, not 4% for most of the decade of 1999-2009. " --> First, a correction. Pakistan has gone above the 7% mark only in 2005 and 2007. 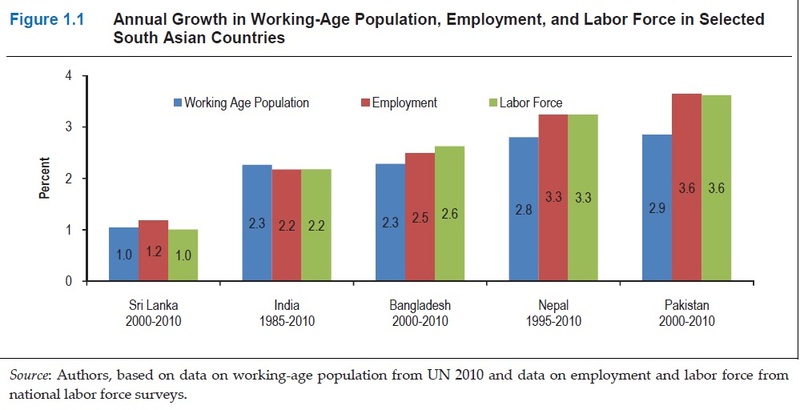 The average growth rate for Pakistan during this decade(2000-2010) is 5.45%. If you consider the projected growth for the year 2011, which Pakistan will not achieve, as always, then the average comes down to 4.77% for a period of 10 years. So, I was not off the mark by much. Pakistan is growing at 4.77%,lets say 5% and missing its mark, the bare minimum growth figures by a whole percentage. Meaning, its growing at only a shade less than 5/6th of the growth it needs to generate enough jobs for the guys entering the market now, not considering the guys who are already without a job. Its no where near the mark of 7% which you claim. Here, is another chart about Pakistan's real growth rate. Here, Pakistan's growth doesn't even touch 7% even once,ironically even during the Musharaff years, which you claim as a miracle. "Almost all of the income growth in India has been in manufacturing and services sectors. The rest of 70% Indians work force (vs 54% of Pakistanis) work in agriculture and textile where the Indians productivity is only two-thirds of their counterparts in Pakistan." --> Yes, same as China during the 1990s. Rather than its agricultural sector most of the growth happened in the manufacturing and other export-oriented sectors. A country is growing doesn't mean that all the sectors are growing at the same pace. Agriculture needs another green revolution. What India is doing now is generating jobs for the educated coming out of the colleges in search for a job. In this decade India will start generating more jobs in the unorganized sector. The kind of transformation which took place in China during the 1990s will happen in India in this decade. I daresay this is already happening. Again, this will not be uniform in the whole of India. Some states will create more skilled and non-skilled jobs in both the organized and unorganized sectors than others. Take Punjab's case for instance. There is infact a labour shortage! Contrast this with Pakistan where established businesses are moving out! Here, is a Pakistani newspaper talking about it. It goes:"On a recent visit to Pakistan, a Hindustan Times writer bought government surveys from a bookshop and found that there was a trend of companies trying to exit the stock market rather than entering it. In 1995, Pakistan had 13 manufacturing firms that had a paid-up capital of over Rs500 million, in 2009 there were just two left. In 1990, there were 58 manufacturers in the Rs50-500 million range. Four survived to see 2009. But the bookshop owner’s surprise that someone was buying these dour volumes was far more illuminating: “No one in Pakistan reads about the economy anymore." So, more people are coming into the job market than Pakistan can absorb. 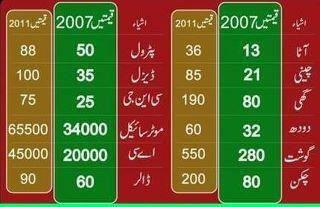 Over a period of 10 years, this are alarming numbers! Here, are reports which talk about rising cases of suicides in Pakistan attributed to the economic situation. This in a country where the official state Religion forbids suicide. In addition to economic hardships, the last report also points to social causes like lack of Recreational Activities like Festivals, Movies,etc. So, my friend, Pakistan has not only stagnated economically but culturally and socially as well, may infact be moving backwards in all these areas. The number of people in Pakistan with extremist views keep growing by the year, apparently due to the actions of foreign countries like India and America. India might have a big economic problem like Poverty but Pakistan has many more problems than it can possibly hope to fix in addition to poverty. The status quo of the Pakistan economy will most certainly not change for the next 5 years atleast. May even stretch on another 5 years. So, Pakistan will pay a heavy price for this bad social, political mismanagement which is contributing to economic mismanagement. Pakistan spends 60% of its budget on Defence and Loan Payments. No wonder it is bankrupt. Indians might be poor but Indian government is certainly not, atleast when compared to Pakistan. So, your army is eating up all the available resource in Pakistan. After the Americans leave Afghanistan and when they stop aid to Pakistan, there will be a huge void left which will make Pakistan officially bankrupt. India is nowhere close to such kind of existential crisis. Most of what you say is irrelevant as far as the facts of poverty and hunger reduction in Pakistan are concerned. There is essentially no disagreement on the fact that India has significantly more hunger and poverty than Pakistan because of serious inequities in Indian society and economy. 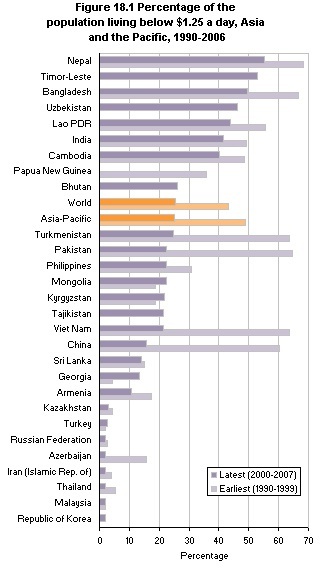 MPI and IFPRI data clearly show this fact over a period of several years. And the reason for inequities is that the income and productivity of 70% of Indians who work in agriculture and textiles who make only two-thirds of their Pakistani counterparts as I have shown through data. This does not compensate for the fact that the 30% of Indians who work in manufacturing and service sectors have higher productivity. It just widens the rich-poor gap in India. The situation in China is very different in terms of their farm productivity and incomes and China's huge emphasis on rural development which is lacking in South Asia. The latest HDR 2010 reminds us of the whole reason why Dr. Mabhub ul-Haq argued for using social indicators, not just the GDP, as a measure of a nation's well-being. The gag order applies to all central ministries and departments and is apparently triggered by the embarrassment over multiple data on Indians falling under the socially damning Below Poverty Line (BPL). The official line is that the government wants to have uniformity on all data and thus the need to centralise information flow. Issued by Cabinet Secretary KM Chandrasekhar on 3 February, the circular says: “It has been observed that some ministries/departments are undertaking surveys on certain sectors relating to their charge and also generating/disseminating data on the same. MS Gill is currently the Cabinet Minister of Statistics and Programme Implementation. Chandrasekhar’s circular says the ministries must ‘ensure strict compliance’ of the instructions. The worst recent case of data causing embarrassment to the government was on the poverty estimates. The Arjun Sengupta committee, the National Commission for Enterprises in Unorganised Sector, said 77 percent Indians were living on Rs 20 a day. The NC Saxena committee said 50 percent of India is poor. The World Bank said 41.6 percent. And then, the Suresh Tendulkar committee, which gave its report to the Planning Commission, said 25.7 percent Indians were poor. This is the Planning Commission estimate as well. This has not been reconciled as yet, and such confusion affects government delivery systems. Therefore, says Chandrasekar’s circular, “Where the ministries/departments still wish to collect data pertaining to aspects for which there are already official estimates prepared by the M/o Statistics and Programme Implementation, the reasons for collecting such data need to be stated clearly and the two efforts should be coordinated. ‘Further, any such data should be produced only with appropriate technical oversight, preferably by the National Statistical Commission. Also, the ministries/departments should invariably consult the Planning Commission before publishing any statistical data relating to the economic status of the population, section of the population or any other sector. In essence, the Prime Minister wants to sanitise data. This could trigger another controversy because poverty figures in India are the core of all government social programmes. Poverty alleviation is considered the default core duty of any elected government in India, given the widespread social deprivation among its citizens. Dr Nawaz* (not his real name) is a medical officer (MO) at Mayo Hospital and, like all government-employed doctors in BPS-17, got a Rs15,000 raise last year, taking his monthly pay to Rs44,000. Yesterday, the Saudi Arabian Ministry of Health offered him a job for 6,000 riyals (Rs145,000) a month. “It’s a handsome offer. I’m going to take it,” said the doctor after an interview with the Overseas Employment Corporation, a Pakistani government agency that is hiring doctors for Saudi Arabia. At Mayo Hospital, Dr Nawaz has to serve in shifts of up to 48 hours straight. In Saudi Arabia, he will get two days off each week and work eight-hour days. “Here we have a lot of uncertainty. We cannot get a raise unless we protest and boycott work. I am getting out of it,” he said. Dr Nawaz has been in a government job for three years and said he would resign before leaving. However, many doctors with more years in government service will likely seek permission from the government to go on leave to Saudi Arabia so they can return to their government jobs upon coming back to Pakistan. Two private Saudi agencies are also interviewing Pakistani doctors for posts in government hospitals in Saudi Arabia. Saturday was the last day of interviews in Lahore. Interviews in Islamabad will take place from January 11 to 13. “Around 3,000 doctors have been interviewed in Lahore for different positions including residents and consultants,” an OEC official told The Express Tribune. He said that the Saudi government had recently built a lot of new hospitals and they were short of doctors. He did not say how many doctors the Saudis aimed to hire from Pakistan. Residents (trainee doctors) are being offered salaries of between 5,000 (Rs121,000) and 8,000 riyals (Rs193,000), while consultants with a fellowship are being offered between 12,000 (Rs290,000) and 16,000 (Rs387,000) riyals. Senior professors and associate professors are being offered up to 30,000 riyals (Rs725,000) per month. Last year, the Saudi Ministry of Health hired a thousand Pakistani doctors. Shortly afterwards, government-employed doctors in Punjab went on strike to demand better pay. “This time they are going to hire more doctors,” said a senior doctor who went for an interview. “The Indian government has just increased the salaries of public doctors and no Indian doctors are going to Saudi Arabia. They are focusing more on Pakistani doctors this year.” The Pakistan Medical Association warned that the country was losing its best doctors to Saudi Arabia and urged the government to improve the service structure for health professionals to stop the brain drain. “The government on one hand claims to invest in health and education and on the other it does nothing to stop the brain drain,” said PMA Joint Secretary Dr Salman Kazmi. A Health Department spokesman said that the government couldn’t match the salaries offered to doctors abroad, especially when they had only recently been given raises. He said the government spent hundreds of millions of rupees on educating and training doctors and they should consider reasons other than monetary for working in Pakistan.